You are at:Home»Installation Advice»Do You Need a Chimney to Have a Fireplace? While modern properties have come a long way in keeping warm during the last few decades, one thing that they do often lack is a chimney. Whether in the name of being environmentally-friendly, or to keep house prices more affordable, chimneys have been given the chop in many new builds. However, the desirability for a fireplace hasn’t waned – it can even increase your property value. So, what do you do if you want an indoor fireplace but don’t have a chimney? If you are starting from scratch, or even have an out of use chimney, there are still plenty of options. Does an Electric Fireplace Need a Chimney? Electric fireplaces are ideal if you don’t have a chimney. They don’t need any source of ventilation and can be installed anywhere you have a main electricity supply. There will be some minor building work to carry out to fit an electric fire into your home. While a chimney isn’t necessary, most electric fire suites will require you to do some drilling or structural work, especially if you need to create a cavity for an inset electric fire. You can read more about how to install an electric fireplace here. If you have a chimney that is out of use, you can still easily install an electric fireplace into it. You just need to make sure that you block the chimney off to stop the draught pulling your heat away from the room. As well as being a perfect option for houses without chimneys, there are many other advantages of buying an electric fire. One of these is the number of fantastic styes available! 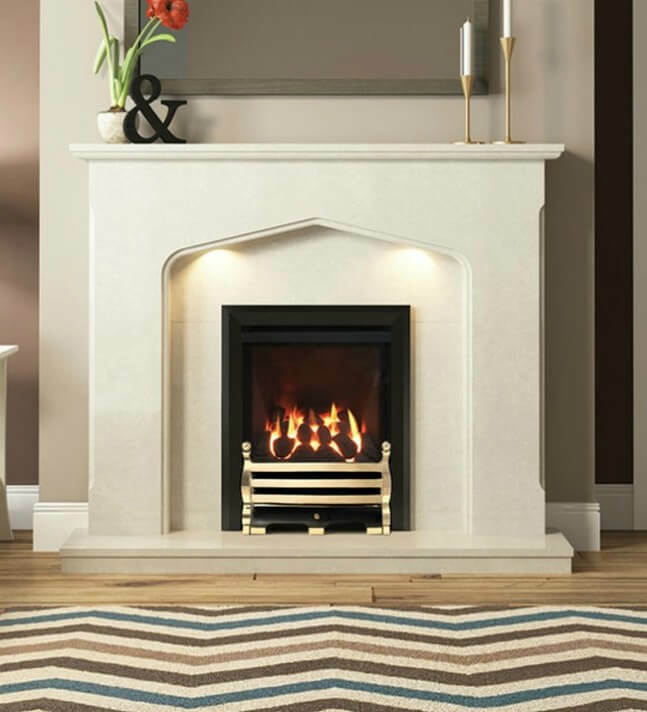 Whether you want a traditional electric fire, a contemporary electric fire or a stunning wall mounted electric fire, you won’t be left wishing for a chimney when you see what your options are! The only downside of an electric fire is that they have a slightly higher running cost than a gas fire. They also don’t give off a real fire – though you can see the most realistic electric fires here. 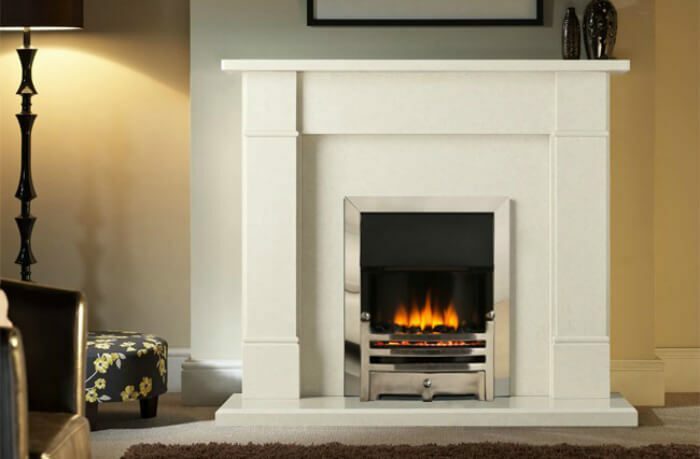 A gas fire is also a great solution for houses with no chimney. There are a few options you could look at, depending on how much work you want to carry out and what look you want to achieve. For houses without a chimney, installing a balanced flue gas fire is a very popular option. While they do require some building work, they are incredibly efficient and available in an array of style choices. 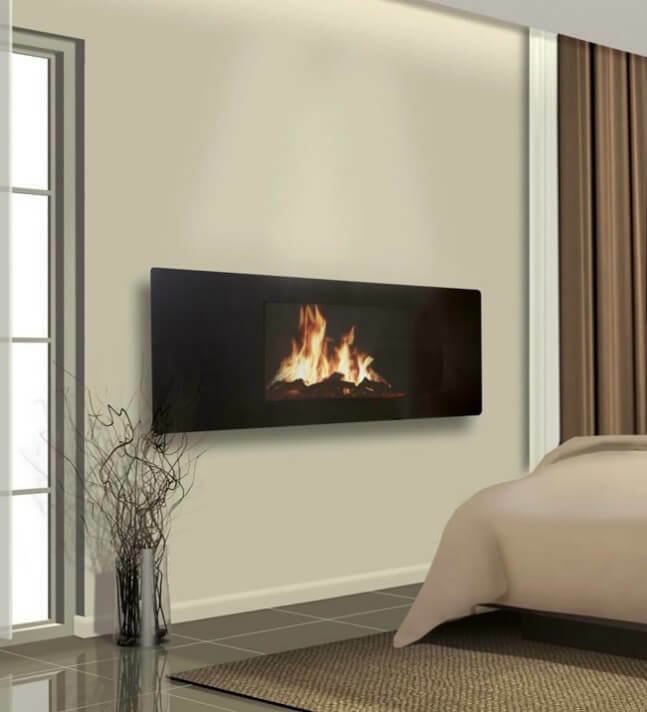 Balanced flue gas fires are sealed from your room with a glass panel. This means no air can escape, which produces heat at an efficiency of up to 90%! They work through a double exhaust pipe which you can build through through any external wall. The air is then sucked in and expelled outside safely, giving you a perfect solution for a gas fire with no chimney. If you are looking for a modern gas fire with no chimney, a hole in the wall balanced flue could be ideal. They sit inside a cavity in your wall for a contemporary look that is possibly even more impressive than an open fire! Our Verine Eden Elite Slimline Balanced Flue Gas Fire is specially designed for those without a chimney and is narrow enough for many wall cavities. To install one, you will need to cut out the appropriate size hole in your wall for it to sit in. You can then attach it to a balanced flue. Find out more with our Hole in the Wall Gas Fire Buying and Installation Guide. 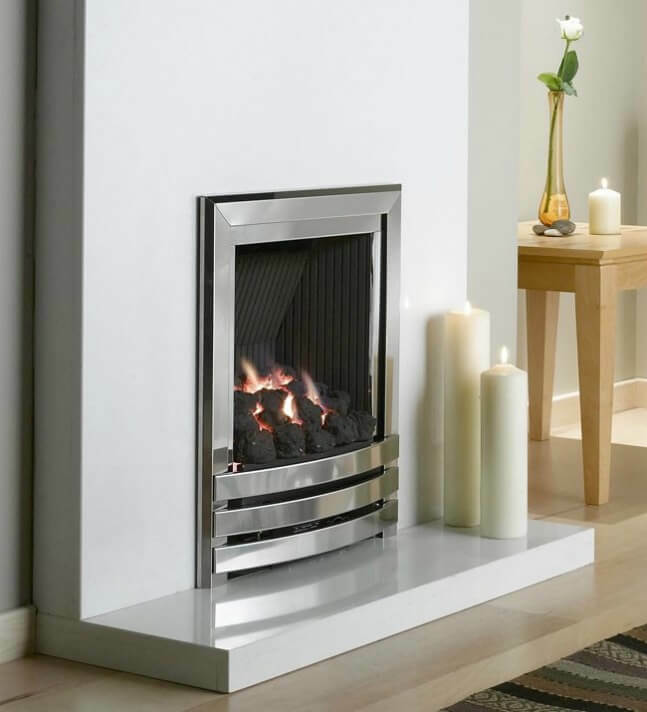 If you aren’t a fan of the minimal look, you can find more traditional looking inset balanced flue gas fires, too. Again, installing these is quite simple and can be built on almost any external wall. With a flueless gas fire, you don’t need to have a chimney at all to enjoy a fireplace. You don’t need to carry out as much building work to install one, either. You will just need to fit a 100cm2 ventilation brick on any exterior wall and connect your fire to a gas pipe. Flueless gas fires work by using a catalytic converter to turn carbon monoxide into harmless carbon dioxide and water vapour. As well as being quick and easy to install, they are 100% efficient and have a low set up cost! 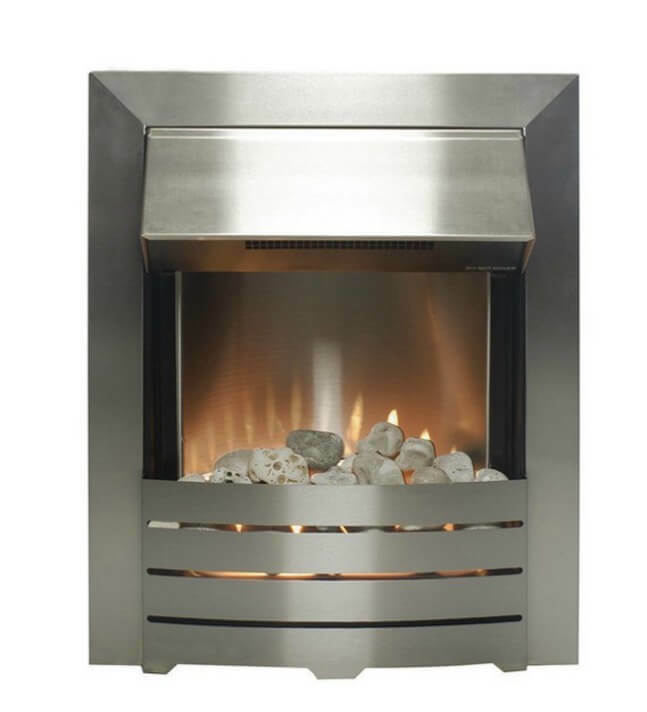 You can also find flueless gas fires in attractive styles, including inset and wall mounted options. Do you want to know more about how you can have a fireplace without a chimney? Call our expert sales team on 0161 376 4181 for more advice.